Giant Eagle's new green marketing strategy comes once again at the right time. 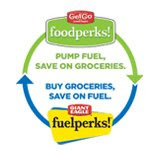 The initial fuelperks! (TM) program that most folks are familiar with is designed to help shoppers save $.10 on every gallon of gas for every $50 worth of food that is purchased. Completing the circle of life and turning that frown upside down can be accomplished now with the foodperks! (TM) program. The idea is to buy 10 gallons of fuel and then you receive 1% off your grocery bill. Heck...just watch the video.